Many of these cards are very expensive on the secondary market. While each From the Vault set has had a manufacturer’s suggested retail price of $39.95, the combination of extremely small print runs and high demand—generated by the reprinting of glossy foil versions of hard-to-find cards with new art—means that these sets sell out really quickly, even when retailers jack up the price. If you want a copy, your best bet is to arrange a preorder with a reliable retailer. As to which cards will be in the set, that info has yet to be spoiled. All we have is the brief description above and a dramatic illustration of some sort of magical cyclone. Naturally, the Magic community is theorizing madly as to what cards you’ll find in the set. Discussion tends to center around the idea that every card in the set will be a board-sweeper. 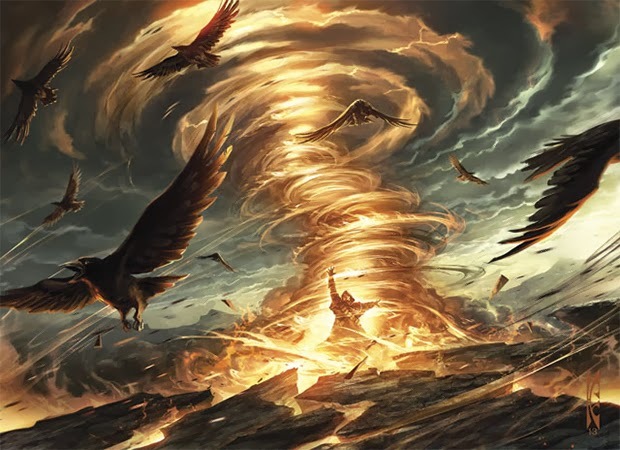 Others theorize that specific word choices in the set description hint at card names, such as inferring that the phrase “blast the opposition into oblivion” refers to the powerful spells Opposition and Oblivion Stone.